Prevention of head injuries is a key safety component in many industries. A head injury can permanently damage, even paralyze a person – or, in the worst case scenario, result in a fatality. The Occupational Health and Safety Regulation designates that “safety headgear must be worn by a worker in any work area where there is a danger of head injury from falling, flying or thrown objects, or other harmful contacts.” The use of hard hats is widespread, spanning across industries such as forestry, construction, and warehousing – many traffic control people even wear safety headgear to better protect themselves on the road. Unfortunately, not all workers are taking steps to adequately protect themselves from workplace head injuries: some workers refuse to wear headgear for “religious reasons”, while others neglect to replace equipment when required, and still others simply “forget” to wear their hard hats. Each of these workers – no matter what their excuse may be – is taking a huge risk with their own physical well-being and mortality, not to mention with the potential repercussions that their employer may face as a result of any head injuries that may occur. Below are some facts about safety headgear (specifically hard hats), aimed to encourage workers to take further steps to protect themselves on the job. Hard hats are designed to protect workers in a number of ways. First, the rigid outer shell resists and deflects any blows to the head that may occur, while the interior suspension system acts as a shock absorber. Some hard hats can shield a worker’s face, neck, and shoulders against splashes, spills, and drips. As well, some hard hats can serve as an insulator against electric shocks, while others can be modified to add face shields, goggles, hoods, or hearing protection. Industrial headgear is divided into three industrial classes in Canada, which are classified based on the headgear’s protective abilities and on the industry in which the head gear will be used. The first class is Class G (General Usage) headgear, which protects against impact and penetration; however, it should be noted that although Class G headgear is manufactured from non-conducting materials, Class G headgear should never be considered as part a protective system against electric shock. The second class is Class E (Electrical Trades), which meets the same impact and retention standard as Class G, but provides a higher level of protection against electrical contact. Although manufactured from a high-grade non-conducting material, Class E headgear is not intended to be used as a primary barrier to prevent contact with live electrical apparatus. Finally, Class C (Conductive Headwear) provides more limited protection against impact and penetration. 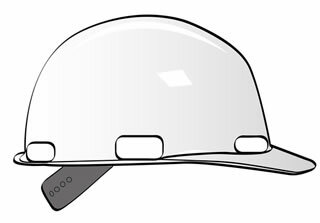 As well, if you add any metal part (such as a clip for holding a light) to Class G or Class E headgear, the headgear will then be reclassified as Class C.
There are a few general guidelines to follow when purchasing a hard hat. Hard hats should be resistant to penetration by objects, and should absorb the shock of a blow to the head. As well, hard hats should be water resistant and slow-burning (in the event of a flood or fire), and should come with thorough instructions detailing proper adjustment and replacement techniques for both the internal suspension and the headband. Hard hats must have a hard outer shell and a shock-absorbent lining, which should include a head band and straps that suspend the shell between 1 to 1.25 inches from the head. This design provides shock absorption during impact, as well as ventilation when the hard hat is worn. Hard hats should be purchased according to employer requirements, and the appropriate class of hard hat for the industry it will be used in. There are various styles of hard hats; to decide which style suits you best, consider things such as sun exposure, the need for either lateral or side protection, as well as the need for a chin strap or hearing protection. When picking out the appropriate hard hat, careful consideration should be given, depending on the elements and hazards that you are exposed to on the job. Workers should always consult with safety regulations – as designated by both the government and by the company itself – when purchasing any type of PPE. First and foremost, always remember to WEAR your hard hat; if it is sitting on the lunch table, on the work bench, or in your car, it is definitely not going to protect you, let alone save your life. You must ensure that your hard hat fits your head properly, having been sized and adjusted for your head, not someone else’s; in other words, it’s best to wear your own helmet, not borrow one from a friend or co-worker. As well, take responsibility for the care and upkeep of your hard hat, replacing the webbing when necessary and checking often for cracks, gouges or other signs of damage. Replace the hat itself when it reaches a state where it can longer provide adequate protection, following your instincts and the guidelines provided by the hat’s manufacturer – if you feel the hard hat has lost its protective abilities but it has not reached its expiry date, replace the hat anyways. To clean your hard hat, immerse it in hot water and detergent, then scrub it and rinse it with hot water; keeping your hat clean removes dust, mold and germs, and thereby increases the life of the hard hat. The use of a hard hat (safety headgear) is a vital safety component in certain types of work. You MUST wear a hard hat if you work in an environment that puts you at risk of being struck by falling objects, or bumping your head on fixed objects (Ie. pipes or beams), or if you work near exposed electrical conductors – but other industry employers may require hard hats as well. While most employers take great measures to ensure the safety of their workers, there is also a huge onus on workers themselves to ensure that they take all the necessary steps to protect themselves from workplace hazards. After all, who else can truly protect your personal safety and well-being on the job better than YOU? Make the smart choice… always wear and maintain your hard hat – save your head, or even your life.